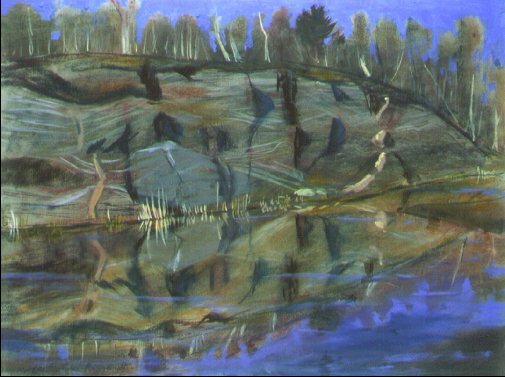 Artist Comments: We were driving down this trail when we spotted this beautiful scenic place with a frog pond infront of an outcrop of the Pre-Cambrian Shield rock. Patrice sat there for a few hours and created two beautiful paintings while we listen to the serene music of frogs singing. There was even a large turtle there, sitting on a rock in the pond, just to the right of the scene of this painting. Check out the other painting, F00401: “Frog Rock – South Face”. Location: Off the Harrison Trail of Twelve Mile Bay, South East of Moon River on the edge of Georgian Bay in the Muskoka Lakes District of Southern Ontario, Canada.